“Are we going outside today, Mr. Gibson?” “Can we play coyotes and rabbits again?” It was my second visit with the fifth grade students at Glenwood Leadership Academy in Evansville, and they couldn’t wait to participate in the predator-prey activities from the week before. It wasn’t in my lesson plan for the day, but educators are flexible. Learning through play is wonderful, and the kids were excited about it. So we made it happen. A lively game of “coyotes and rabbits” dramatically demonstrates predator/prey interactions, habitat needs, and population fluctuations. Jennifer started “By George, It’s Science!” to honor her late father, longtime Indiana University biology professor George Hudock. She saw a need for elementary students to be immersed in the life sciences, so she forged a relationship with Glenwood fifth-grade teachers and Bosse High School to provide activities and field trips for the elementary grade students. Sycamore’s Environmental Education Program has joined the partnership to provide nature-based lessons at Glenwood. This expands the learning opportunities for students as they make connections from their field trips, lessons with Bosse High students, and now with Sycamore. Predator-prey, producers- consumers, habitats, bio-accumulation, and the inter-connectedness of all the components of life are just the beginning of what we’ve studied. 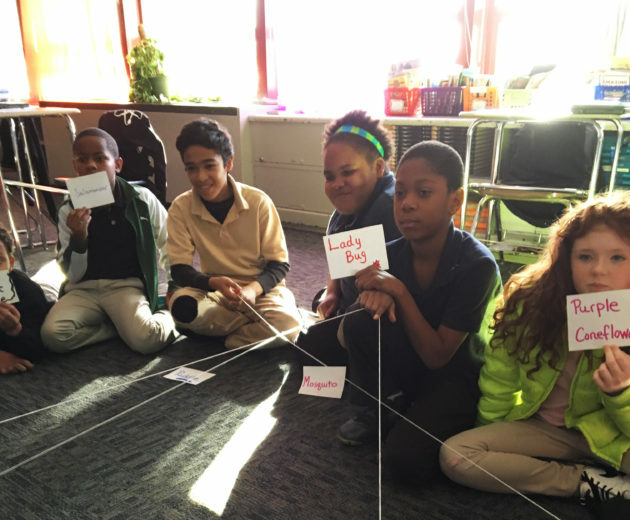 Students at Glenwood Leadership Academy in Evansville participate in a web of life activity. The Glenwood Leadership Academy campus is a lovely place with mature trees and a large open field where I watched a red-tailed hawk hunt during my first visit. A dragonfly made an appearance for students on an unseasonably warm November day. 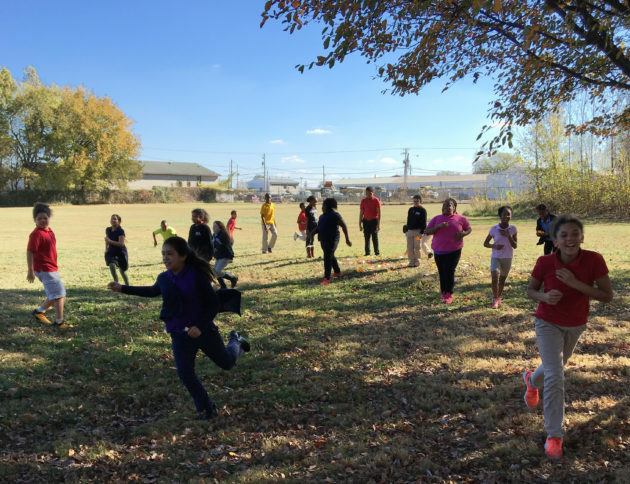 The discoveries and learning opportunities are limitless with these fifth graders, who relish any opportunity to go outside.